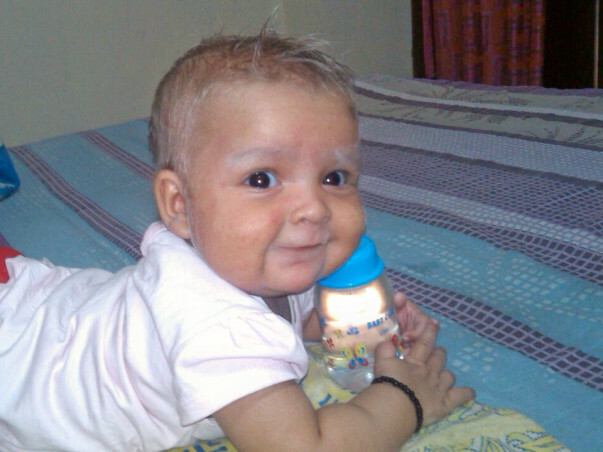 My daughter, Baby Riddhima was developing fever when she was first hospitalized on 15th November 2014 at Hinduja Hospital, Mumbai. but Dr. from Hinduja could not diagnosed her through various investigation, later they have transferred to Wadia Hospital Mumbai, there they tested bone marrow and found that she is affected byHLH (Hemophagocytic Lymphohistiocytosis) Griscelli Syndrome. where she had undergone Chemotherapy and medication for (42 weeks) for which she remained hospitalized till 1st-Dec-2014. Later, we were referred for further treatment Bone Marrow Transplant as prescribed by Wadia Hospital. As a last resorts, her only way of survival is Bone Marrow transplant so We consulted at AIIMS Delhi Hematology and Oncology department. For Bone Marrow transplant under the care of Dr. Sameer Bakhshi, Registration no (IRCH No. 175802/15) and they have given Estimate Certificate for treatment. The estimated cost for Core Blood Transplant is Rs. 15 lakhs. The Insurance Company too denied providing coverage / reimbursement, as HLH is caused due to genetic disorder so they do not cover such cases. Till date, I have spent nearly Rs.2 lakhs towards treatment, diagnosis and investigations for HLH (Hemophagocytic Lymphohistiocytosis)Griscelli Syndrome. I have been trying TO RAISE FUNDS through various means but I am finding it a very big challenge to arrange this huge amount. Whatever I had saved has been spent for this treatment and in addition I am now burdened with loans. I make a heartfelt request to kindly help me for the treatment of my daughter. I shall be greatly indebted. Your Timely help could give her a new lease of life and she may be able to lead a normal life. The estimate has been attached for Bone Marrow Transplant below. Every contribution as little from you can help us. Please come forward and help our 6 month old baby. 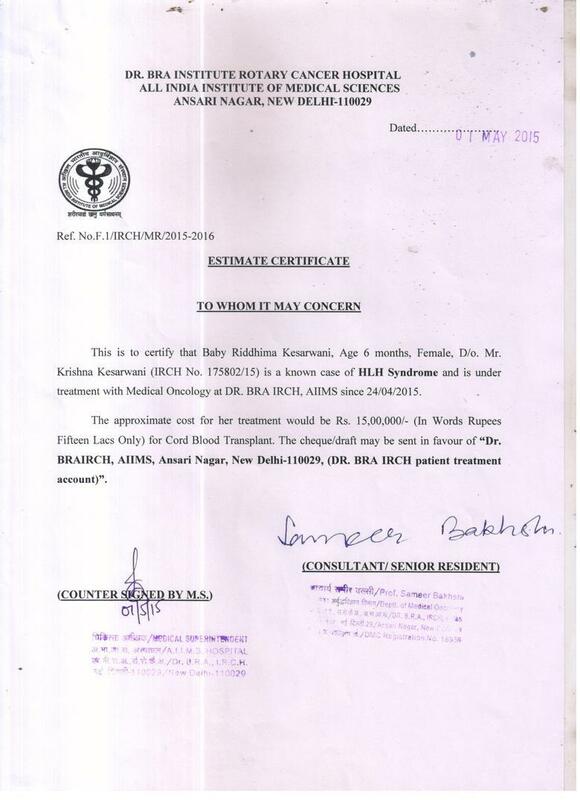 As doctors suggested the Bone Marrow Transplant should be done as early as possible for my 6 month old daughter which will cost around 15 lakhs. If any information you need from my side kindly mail me @ krishna.sap981@gmail.com or call me at +91-9867508656. We have a good news to share. Riddhima is discharged from the hospital. She stays in Delhi and goes to regular check-ups once in 15 days. This will continue for another 6 months. Her platelets count has improved and she is recovering well. Riddhima's father has resumed work since he away from work for long to take care of her. Her mother is with her. The parents are super happy to have their child back. Really happy to share this news with you and we can't thank you enough for the support. We will keep you posted with more updates. Here's an update from Riddhima's father. Hope you are doing well. I want to update you about Riddhima. She is still in the hospital, recovering. She needs to undergo blood transfusions every alternate day. Another 2 months will be needed for her to recover. Thankfully, we have been able to get 20 individuals to donate blood for Riddhima's transfusions. It has been long since my daughter came home but we are happy she is atleast safe and not in danger. It was your help that we could pass each day in hope. I will never forget this help. I will pray for your happy life and complete cure. Get well soon princess..God bless! !